As a writer, your presence on social media is key. If you’ve followed this blog for any length of time, you’ve seen us discuss follower counts, Twitter, platforms, and social media in depth. Today we’re looking at who you are on social media. You’re probably thinking, “Um, I’m me. Who else would I be? And why are you asking me to be someone I’m not?” Think of it more like a persona or a character. Still not sure? We’re going to let Christy Huggins of Eventbrite explain in this excerpt of her recent post for Grammarly. Refining your personality on social media can be a daunting process. Individuals and brands get into trouble trying to create an entirely new personality on their social media accounts. Social should be a channel for you to deliver and develop a personality—but not to create an entirely new one. That can come off as forced and inauthentic. If you’re writing social content on behalf of a company or brand, finetuning your personality is about writing copy that taps into your followers’ emotions. That’s why we teamed up with Grammarly [on a] project where we unveiled five characters that accounts like yours should embody on social media. Find the one that most aligns with your personal or brand voice, and discover the emotions you can inspire. We all have that one friend who’s always in the know—the early adopter of new apps and the person we turn to when we need fresh music recommendations. Everyone wants to hang out with her. We want what she’s got. Newport Folk Festival is the oldest and most well-known folk festival in the U.S. The brand’s social media presence taps into its deep connections with folk superstars new and old. When you need advice, you know that this person has done his research, weighed the pros and cons, and possesses innate wisdom. He’s your “expert” friend, and you trust him implicitly. As a brand, this persona is a thought leader of its genre. If you’re a rock music festival, you’re the rock music festival. Or if you’re a yoga and mindfulness brand, you know how to prove your mettle. The 3% Conference shares career inspiration, articles with expert guidance, and job opportunities on their Twitter page, which has nearly 20,000 followers. Sometimes, we just want to hang out with someone goofy and low-pressure. This is our friend who sees the humor in every situation and is always up for fun just for the sake of it. If this is your persona, your posts will run the gamut from whimsical to humorous, and will typically use bright colors and short, quippy text. National pop-up, The Museum of Ice Cream, consistently uses bright, ice-cream-worthy colors and whimsical themes in its social media posts. The tempter knows the best bars and most picturesque hiking locations. Whether a foodie, a travel inspirer, or a fashionista, his posts always make you want to splurge on something. Eat Drink SF’s social media pages are visual feasts, showcasing the best of San Francisco eats year round — not just when the annual festival approaches. Your innovator friend is often a tech visionary or an artist. Whatever medium they belong to, one thing is always for sure—they do things their own way. As a social media persona, the Innovator finds new ways to post and share content. Posts are eye-catching, with a certain spark that makes you want to know more. 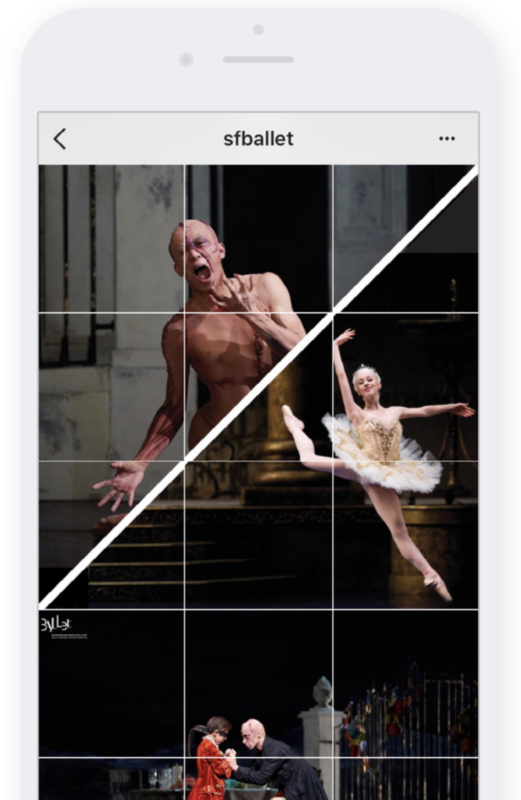 San Francisco Ballet is a legendary ballet company, and its social media presence is equally creative. Shots like this are made up of individual posts chopped into sections, then pieced back together in the profile like a visual puzzle. See, we knew you would understand! So, as a writer, what will your online persona be? Often writers make fabulous “trusted advisors” on their particular topic. However, you could certainly use any of these characters as a voice for your social media brand. At Certa Publishing we are constantly amazed by the creativity of our writers. But what if the creative marketing juices just aren’t flowing? We’re here for you! Contact us today to learn more about our marketing services, including full-service social media management. Having a dedicated author website is more important than you think. It offers credibility, access and a one-stop resource for your readers. But where do you start? Last week we shared part of Kimberly Grabas’ post entitled 11 Author Website Must Have Elements, which clearly lays out everything you need to set up the perfect site. There are two areas to focus on when it comes to social media and your site. The first, is to provide visitors the ability to find and follow you on your various social media platforms. Add a sharing plugin to every page on your site, so visitors can share your pages via all the major social networks. The free plugin I use on YWP is called SumoMe, but there are many to choose from. Depending on what you have to offer, you may have separate pages for your books, products and services, or combine everything in one. For books, include a large cover shot, an enticing blurb and clear details on purchase options (with links). You may want to feature your current project on your Homepage. Provide a link to your Book page for visitors to get additional information about the book, get some behind-the-scenes info or promotional materials. (A press/media Kit for each book would be ideal). Tip: If your books are available on Amazon, join Amazon Associates and you will be provided a code to link your book. You will also get a percentage of whatever a buyer purchases after they click your link–even if it’s not your book (lets hope it’s a T.V.). Once you have signed up for an account, type in your book title. When your title pops up, click “get link”, and Amazon will give you a variety of options to customize your link. Just copy and paste that code where you want it on your site (sidebar, Book page), and your book will show up with a buy link. Websites with blogs get 55% more traffic than websites with no blog. As well, having a blog creates fresh, additional pages of content which is great for SEO (Search Engine Optimization). If your goals are to be seen by more people, drive potential book buyers back to your site, and establish yourself as an industry authority and thought leader, you need to include a blog on your site. You can entice your current and future fans with exclusive, unpublished content, inside information and downloadable extras, like sample chapters. Readers find it especially appealing to find out who their favourite author reads or recommends. This is often a missed opportunity to not only engage with your readers, but network with and support your peers. No matter how famous, everyone loves recognition and appreciation, so share the love! This is also a great way to get inbound links–other sites linking back to your site. This too, increases your importance in the eyes of Google. Utilize your blog’s comment section to converse and engage with your audience. You can even encourage interaction between your readers by encouraging them to comment or reply to each others comments. You can have excerpts of your most recent blog posts on your Homepage, which will dynamically update each time you publish. This keeps the content on your Homepage fresh, and encourages people to return for more. A blog gives you the freedom to add additional content and bonuses (see below) without cluttering up your Homepage. Latest News/Events: interviews, blog mentions, reviews and other media coverage items you can share with your audience. Appearances: book readings and signings, speaking engagements, interviews, conferences and professional events, workshops and so on, so your fans can find out the details and attend. The purpose of a press page or media kit is to easily provide the media, or anyone wishing to profile you, with the info they need to feature you in their piece. Basic author bio, including contact info. Author photo (use a professional-looking headshot), and any additional photos that can be used when writing about the book. Information about the book, including a sample review, sample chapters. The simplest way to make your media kit available is to turn the contents into a PDF. Provide a brief description and a link on a page on your site. Make it easy to find, and consider carrying around a few hardcopies at conferences/events, in case you receive a request for a copy. Get the creative juices flowing! There are many fantastic ways to build value into your website for your readers and to keep them coming back for more. You can include a slideshow of photographs, sketches, illustrations of characters and locations in your book, and other meaningful images. Add other multimedia like audio files, a podcast, YouTube video and video trailers. If you are an expert in your field, and your book is an extension of your career, include things that spring from the larger context of your work and experience. Younger fans are often interested in contests, games and prizes (autographed books). An author’s favourite book, music, and movie recommendations are also fan favourites, so include these and some of your other influences. Include sneak peeks, additional content that isn’t in your books, main character bios, extra chapters, alternate character POV’s and any other bits that didn’t make the cut. Your readers will love it! At Certa Publishing, we believe that our authors’ content has the power to transform lives and communities, so we are passionate about people finding your books. An author website is absolutely essential to your marketing. If you still feel intimidated by the process, we would love to help. We can either tweak what you already have or help you find the perfect partner to create one from start to finish. Contact us today! We have some bad news. Even if you have the world’s greatest social media interactions and thousands of newsletter subscribers, you’re still missing a key marketing component: the author website. Don’t fall into the trap of thinking that a killer Facebook page or YouTube channel can take the place of an author website. Having a dedicated URL means something to readers and publishers. So what should your author site look like? What content is most important? We’re glad you asked! Kimberly Grabas authored the post 11 Author Website Must Have Elements, which we suggest for anyone beginning to build their site. Your author website is an essential piece to the successful book marketing puzzle, but as always, first impressions matter. It is tempting to just get something up quickly, that requires little cost, and get back to the joyful torture of writing your novel. However, while it’s certainly possible to set up your website quickly and with relatively little expense, it is extremely important to remember that your website represents who you are and what you have to offer. A website will help to increase not only your book’s visibility across the internet, but yours as well. In many cases, it may be your future fans first impression of you–especially if you have not yet published. Make sure that your site reinforces the image you wish to portray. Will people know what I write within seconds? Does the voice, tone, attitude and mood of the site resonate with my ideal reader? Will they understand the page they are on and what it’s about? Does the site appear credible? Is it clear why they should buy my book or subscribe to free updates? What does the site provide the reader? Just like it’s important to have fresh eyes editing your novel, ask others for their answers to the above questions and get their opinions on the first impressions your site gives rise to. You might be surprised at their answers! Your site should look clean and uncluttered. Less is more, especially in your sidebar. And white space is your friend. Your site is polished, legible (go for clear, not clever) and spell checked. Choose larger font sizes and colors that are easy to read. Light fonts on dark backgrounds or minimal contrast between font color and backgrounds are difficult to read. Keep navigation easy and clear, so your readers can find the important stuff. Use color to draw attention to select elements. For example, pick one color to be your “action” color. Whenever you want a reader to take action by clicking a link or subscribing, ensure you use that color only for the link or button, and no where else. Avoid a chaotic mix of colors. Instead pick two to four colors for your design template and don’t try to make everything stand out–then nothing will. Avoid anything unnecessary like Flash (Apple currently doesn’t support Flash), animated backgrounds or music. If your site takes a long time to load, or doesn’t work on a mobile device (iPad), you will lose a large number of visitors to your site. Keep elements consistent from page to page. Is your site branded for longevity? Is it book/genre specific or limiting, given your future writing plans? You do not want to rebrand or redesign the next time you publish. Remember, your site has to be compatible with different browsers and devices, so check how things look on multiple browsers, tablets and phones. Create content that is useful, engaging and well organized. Your posts and copy must be easy to scan. (Ugh, I know! As a fellow writer who bleeds over every word, I feel your pain!) People read differently online, so use bulleted lists, section headers and short paragraphs to convey your message, and learn the importance of writing a magnetic headline. About pages are among the most frequently visited pages on the internet. Your readers want to know more about you, and this is the place to tell them. Consider having a professional headshot and short blurb from your homepage with a link to your About page for more information. 1. Start with a persuasive headline, that lets your visitor know what they can expect. 2. Reassure your readers that they are in the right place and tell them what your site will give them. 3. Strengthen your credibility with some testimonials, reader quotes or other forms of social proof (more on this below). 4. Tell your personal story. Frame your content around what led you to writing, why you write the kind of books you do, what you love about it. Make sure your personality shines through! You can also include your writing credentials and professional associations. 5. If a visitor gets to this point in your about page, you’ve got them interested. Ask them to join your email list, and provide a link to your books, services or other products. What do you want to know about your favourite author? Include that. Keep your About page and Bio up to date. Link to your Media Kit/Press page if you have one. Be personal, but be careful not to over share; stay professional. For more tips on creating a fantastic about page, check out this post from WriteToDone or get some ideas from these great examples of About pages from Smashing Magazine. It’s surprising how difficult authors will make it for their readers (media, agents, publishers…) to contact them. There might be a tiny email address buried at the bottom of their website or noted on some obscure page deep within their blog. DO NOT make your visitors hunt for your contact information! If your goal is to engage with your readers online, don’t play hard to get. Have a contact tab in your top main menu that leads to a page with your preferred ways to be contacted. Don’t list every possible way you can be found, just the best ways. If you use a contact form, make sure it’s simple and you’re only asking for the info you require to get back to that person. If you note your email address, use yourname[dot]com to avoid spam harvesters. You can also encourage your readers to get in touch with you via the social platform(s) you are most active on. Provide multiple ways for people to contact, follow and Like you. It’s not your readers’ job to find you. It’s your job to be where your readers are. It is never too early to start collecting email subscribers. Early sign ups are the most likely to be your biggest fans and most ardent supporters. These are the people that will forward your new releases and insider updates to their friends, evangelize you on Twitter, attend your events or push up your sales rank on Amazon when they hurry to get your new book. I highly recommend using Aweber to manage your email list. Using a high quality, industry leader for your email list management is important to ensure your emails get to your fans and not their spam boxes. It’s easy to use, with tons of step by step videos, and very helpful customer service if you get stuck. And putting your form on your site is as easy as copying and pasting. Don’t panic! You do not have to produce a newsletter every week. Catherine Ryan Howard at Catherine, Caffeinated makes a point of letting you know up front that “nothing much happens… an email about once a month will cover it…” Just keep in mind that you should not be ‘selling’ something every time (and the only time) you contact your subscribers. Just an email address, or first name and email address is enough info. You don’t want to scare people off by asking for more. Your email optin box should be bigger and bolder than other elements on the page, but don’t overdo it. Make all links and buttons your ‘action’ color (as above). And make sure your links and buttons look clickable. Consider including a signup incentive, like a promo code for your latest book, a bonus chapter, a sneak preview of your next book, or a free chapter from a different character’s POV. Social proof, testimonials and positive quotes from fans and reviewers can go a long way in increasing your credibility and authority with visitors to your author website. Place real, short and powerful testimonials on your site. Include positive reviews, quotes from fan mail, notable media coverage, and if you have a significant following on Twitter, Facebook, Goodreads, Wattpad and so on, note it. Great locations for your fan testimonials are your About page, Homepage and on your sidebar, just under your email sign up form. Come back next week for the remainder of this comprehensive list of must-have author website elements. Keep in mind that Certa Publishing is here to help, no matter where you are in the process of building your author site. We can recommend who to partner with for website design or simply look over the one you’ve already built. We’d love to hear from you! It seems simple. You want to sell your book internationally, so you need to have your book translated. Between your Spanish co-worker, Portuguese sister-in-law and French professor, it shouldn’t be so hard. Maybe you can pay them a bit or barter services. Simple, right? Not so fast. A little-known fact is that a translator can claim the copyrights to their work. Surprisingly, this is legal! According to their site, the U.S. Copyright office may consider “a translation of a novel written in English into another language translation” a “derivative work,” and its rights available to be claimed by the translator. In order to prevent this, we recommend that you have a legally-binding agreement with your translator drafted before the work begins, which clearly delineates who will retain rights to your work. Even a perfectly accurate translation can miss the mark. Why? Because localization is just as important. Localization is the process of evaluating your manuscript through the lens of the local reader. Do your examples make sense? Are your jokes still funny? Are there references that are acceptable in English, but offensive in another language? A good book translation is more than simply saying the same thing in a new language. It requires careful adaptation of the tone, message, and structure of the piece to maintain the power of the original without causing misunderstandings. Not every native speaker makes a good translator! Because you usually don’t read in the target language or know a native speaker, you may never know the quality of your product. Your best bet is hiring a reputable translation service with good credentials. 3. Don’t forget the marketing! Let’s think about all the work you have (or will) put into getting your book into the hands of English-speaking readers. Market research. Paid promotion. Building social media platforms. And so much more. These efforts will need to be replicated in your international markets as well. Don’t make the mistake of assuming that simply publishing your book in another language will ensure sales. For this reason, before you begin the translation process at all, we recommend taking a big-picture view of international marketing to ensure that are ready to make such a commitment. Surely now it’s obvious that your Portuguese sister-in-law is not going to be up to the task of translating your book, no matter her mastery of the language. It’s time to turn to a professional. Here’s where Certa can help. We recently launched our translation services. First-rate book translation is now offered from English into the following languages: Spanish, French, Italian, German, and Portuguese. Not only that, we are also offering editing, proofreading and typesetting services in these languages. Spanish is currently the most popular language pair for publishers and authors in the United States. If you have considered expanding your work to reach the Hispanic population—but didn’t know how—the time is now! The number of Hispanics in the United States is growing exponentially, with over 50 million Latinos in the US alone. Certa Publishing can now help you reach this vital market. The doors to new opportunities are now open! Let the words the Lord placed in your heart be seen by the eyes of many. Even those you never thought you could reach. Contact us today! When you see those golden arches, you know it’s McDonald’s. No guessing required. Same with the Nike swoosh. Would your “brand” be quickly familiar to your audience? If not, you can change that today. Your brand voice includes a visual presentation. Choose a distinct color palette, typography and logo. Have a professional headshot taken and use the same photo consistently across all touchpoints. Make it easy for your fans to recognize your brand from a mile away. Look at this example from the team at Risen Motherhood. What do you notice? There’s nothing fancy here, but there is consistency of colors, logo and style. Now it’s your turn. Go to your website, blog, author pages and each of your social media accounts. Is your “branding” consistent? If not, take the time to make that change. We always encourage our Certa authors to make the most of their content by leveraging it for social media posts. Your manuscript is likely full of quotes and scriptures that can be easily dropped onto an image and posted on social media. Graphic tools like Canva and social media managers like Buffer make it easier than ever to do so. Quick-format social media also makes consistency easier. You can easily jump on Instagram stories each day to share an inspiring thought, poll your audience or share a photo related to your work. Twitter is also the perfect place for shooting out a quick thought, interesting link or question. At Certa Publishing, we recognize that many of our authors lead very busy lives and find it difficult to be consistent in building a platform. We would love to help you in this area. We can help you create a social media calendar, manage your social media entirely or even provide ghostwriting for your blog. Contact us today to find out how we can help you. You’re already intimidated, aren’t you? You want me to make a video? I’m a writer, not a video producer and editor! Take a deep breath. We get it. The idea of making a book trailer can be so overwhelming that most emerging authors skip it altogether. But give us a few minutes and you may find that the idea is much less daunting, and even more exciting than you realize. 1. The animated trailer – Think Powerpoint but better. You are basically using a presentation software to make slides containing images, book art, video and text. These slides are then merged into a video file that can be uploaded to YouTube or other mediums. In his article How to Make a Book Trailer, Henry Herz offers a great overview of some apps you can use to create a polished, simple (and possibly free) book trailer. Animoto: Make 30-second animated trailers for $8 per month. Prezi: Make click-through presentations that are trailer-quality. Photoshow: You’ll love how easy it is to use, but keep in mind that the free version only lasts 30 days. 2. The author-driven trailer- This trailer focuses on the author. It can be an interviwe or simply you talking to the camera. This can be as simple or complex as you like. All you need is a camera, good lighting, some editing experience and a well-crafted pitch. The good news is that most newer iPhones and Android phones have both the recording and editing ability to create a quite professional-looking video. But if you’re not comfortable doing the recording yourself, you can hire a film student or local photographer with a nice camera. The beauty of this type of book trailer is that the reader doesn’t just get introduced to the book, but also to you, which offers them an immediate connection. If they find themselves relating to you personally, they are much more likely to give your book a try. 3. The Hollywood-style book trailer– Yes, this one won’t be free, but it’s the most likely to go viral and hold the viewer’s attention. However, with some creativity, a Hollywood-style trailer doesn’t have to be a budget-buster. Free software such as iMovie (already installed on Apple computers) and MovieMaker (free to download for Windows users), make it easier than ever to create a very polished trailer. You can either hire a videographer to capture the footage you need, or you can tap into free stock footage resources like this one. It doesn’t take a big budget, but it does take a big idea. Successful marketing is about spreading a worthy idea in an interesting and surprising way that makes your audience the hero. Video is a powerful way to do that, so long as you do it right. Perhaps you’re on board with the concept of a book trailer, but still unsure of your ability to pull it off. We would love to help you! Certa Publishing has created many book trailers for our authors and we would be glad to do the same for you. Head over here for more information, including pricing and some of our work. We look forward to hearing from you.